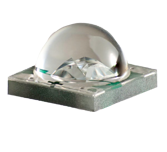 Optimized for directional, high-lumen applications, from indoor and outdoor to portable and lamp retrofits, the XLamp® XT-E LED delivers high performance and high reliability in the industry-standard XP/XT footprint. The XT-E LED offers the benefits of the XT/XP platform — compact and proven 3.45 mm x 3.45 mm package and established ecosystem — enabling lighting manufacturers to simplify the design process and shorten time to market. The XT-E LED is available in royal blue and white. The XT-E White LED offers a high-efficacy option. In this document, the term White denotes the white XT-E LED without regard to its efficacy. The terms Standard and High Efficacy are used when necessary to differentiate the performace of the High Efficacy XT-E LED from the XT-E LED without the high-efficacy option.